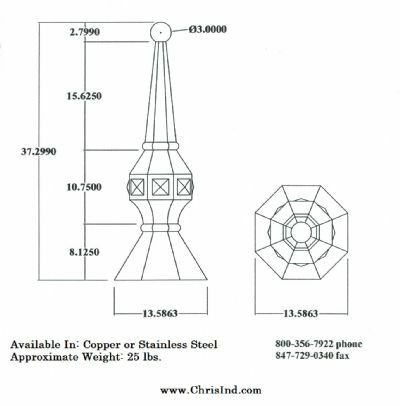 Stock or Custom, your design or ours; Chris Industries offers a wide variety of finials and spires including historical reproductions. 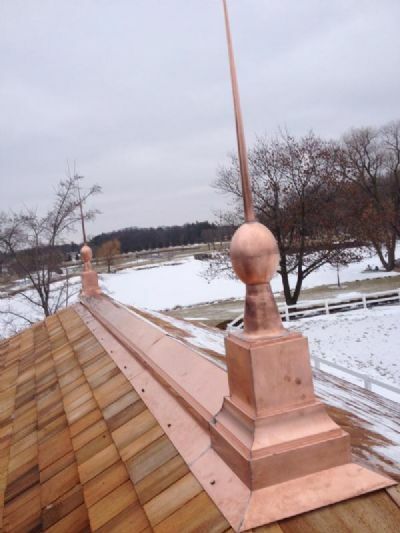 Made from 99% pure copper with each seam fully soldered for maximum longevity. In order to assure the highest standards in quality custom fabrication, Chris Industries has a design processes which entails several steps that is used on most projects. First, each project is designed on CAD. This ensures that all the measurements will be correct. Next, the material for the project is cut with a high power water-jet cutter using the same CAD program. This removes any chance of error when cutting the pieces from the sheets of metal so that everything fits together perfectly. The time we save by using this project results in savings for our customers. Finally, the pieces are soldered together and riveted where necessary to create a durable long lasting architectural masterpiece for your home or building. F4 check sale page for price.